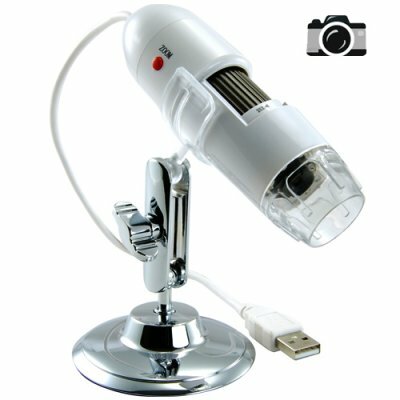 Successfully Added USB Digital Microscope with Super Macro + LED Light to your Shopping Cart. This brilliant magnification tool plugs directly into your computer without the need for batteries. Built with 8 LED's and a brightness control dial to make sure you always get the best captured image. This special digital microscope can be used in fields such as medicine, education, textile, jewelery and many more. Take still shots, or capture AVI movie clips for storage and later viewing. As an added bonus, this high end Digital Microscope with Super Macro gets its power directly from the USB port, meaning that you never have to worry about batteries. If you are a dermatologist or a trichologist, then you can use this digital microscope to inspect skin and Alopecia problems in your patients with minimum effort. If you are a biology or chemistry student, you can do work at home and not have to always travel to the campus lab. If you are a jeweler, this is a great way to make detailed examinations for yourself or clients. And if you just enjoy science as a hobby, then this is going to bring you hours of fun! This innovative and amazing digital microscope gadget is available in stock today for single and bulk purchases. Get yours today and an incredible factory direct wholesale price from the leaders in wholesale electronics, Chinavasion. Will the Digital Microscope also work on my windows 7 operating system? I keep clicking the Zoom button but the digital microscope camera does not zoom? Bought one as a sample and used it. Very easy to operate and easy setup of the software. I am now listing them on my site and E-Bay as dropship items. This is a fantastic and very portable piece of equipment that can be used in many different capacities.